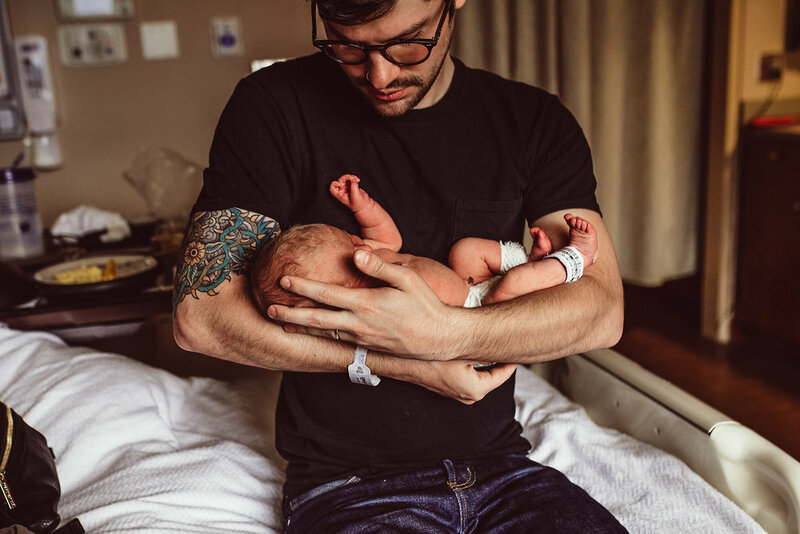 All birth story packages include: A one hour in-person consultation to get acquainted and to go over details, 24/7 on-call availability starting at 38 weeks until the birth, photo coverage of active labor through 1-2 hours post delivery, and a back-up photographer at the ready, just in case. Being a birth worker for the last few years has really given me a new appreciation for women and the strength that we posses, often without even realizing it. It has also opened my eyes to how beautiful it is to witness the support system in action as women birth their babies - and those first moments once baby is here, the love and admiration in the room. It is my goal to document those memories, even those you may not have noticed so that they will stay with you and your family for generations to come. What is birth photography and why should I consider it? Birth photography is the art of capturing the story of the day that you welcomed your little one earthside. Birth photographers document and capture details of your story; your partner supporting you through contractions, your dog by your side during early labor, the look on your face as you meet your new son or daughter. There are so many moments that make up your birth experience, moments that you may not have noticed or that you may have forgotten. I’m there to quietly document those moments and tell your story so that you can treasure and cherish that day forever. By hiring a photographer, you know that you will get professional images and your birth team can focus on doing what they are really there for, supporting you. Portland, Oregon and its surrounding areas. I live in Lake Oswego, which I feel puts me in the perfect location for doing what I do! I can get to most local hospitals and birth centers within 15 to 25 minutes (no traffic). Five minutes if you're delivering at Meridian Park! Cities I serve include: Portland, Lake Oswego, Tualatin, Tigard, Sherwood, Beaverton, Milwaukie, Wilsonville, Oregon City, Gresham, Hillsboro, and Salem. What is the best time to book my birth story package? In short, ASAP. I currently only book 1-2 births per month, and they do fill up. I suggest that as soon as you are considering hiring a birth photographer, shoot me a message and we'll get in touch to see if you think I'll be a good addition to your team. Even if you haven't told all of your friends about the pregnancy just yet, I promise your secret is safe with me! When do you arrive and how long do you stay? I usually come to your birth during active labor (often around 5cm) and will stay up to 2 hours after delivery. Sometimes. I prefer to use natural light, but sometimes births are just really DARK. My camera can handle the low light, but the results turn out pretty grainy. If you're cool with that and prefer no flash, then I definitely don't have to use one. We'll go over all of this when we meet, though. I'm a Nikon gal. I use a NikonD750 coupled with a Sigma Art 35mm 1.4 lens almost exclusively (for both photo and video.) Of course I always carry a backup camera in my bag as well, just-in-case. I use a speedlight attached to my camera when using flash. For video, I have an external mic attached to my camera body. What if I go into labor before 38 weeks? Even though my "on-call" window technically starts at 38 weeks, it's likely that I will be able to make your birth if your labor starts earlier. It might take me longer to get to you, but most of the time I will be able to come, unless I am out-of-town. Absolutely! It's up to the hospital staff whether or not I'm allowed into the operating room, but I have attended quite a few cesarean births to date. If the staff decides not to allow me in during the surgery, there is still so much of your story we can capture and preserve. I will document the little details including any moments I am able to capture before the surgery and those precious first moments after the delivery. If time and situations allow, I will also send one of my cameras (set to auto) in with your partner or a nurse to take pictures in the operating room and recovery. What about a scheduled cesarean? I can do those, too! The same answer applies as for unscheduled cesareans: it is generally up to the anesthesiologist whether or not I'll be allowed back for the surgery. (also see answer above.) I do not offer discounts for scheduled cesareans at this time. Inductions are treated just like any other birth. Sometimes inductions can last for a few days, so I ask that we remain in regular contact throughout the process. If time allows, I may come to the hospital for the start of the induction and leave for a while until things really get going. I'm a bit nervous about being completely exposed...do you take pictures of EVERYTHING? At first it does feel a bit intimidating having someone with a camera in your birthing environment, doesn't it? Not to worry! I have worked as a labor doula since early 2013 and am great at helping to preserve a calm birth environment. I also know how to fade into the background and most moms forget that I'm even there - even when flash is used! When we meet, we will discuss what you would like photographed and if there is anything you would like to avoid. Your comfort is my top priority, so if there is anything you don't want me documenting, I'm happy to oblige. Having said that, some of my clients just choose to keep the more intimate moments to themselves. We also spend some time during our consultation getting to know each other - I really want you to feel good about adding me to your birth team. And in reality, the actual delivery of baby being born is maybe only 5% of the images you'll get. There is SO much more to your story. I absolutely love sharing birth images because I feel that it helps to normalize the experience in our society. Our culture has placed such a negative stigma around the birthing process and part of the reason I do what I do is because I want to change that! Women are strong and birth is beautiful! Having said that, you always have the option to opt out of me sharing any of your images. If you do sign a model release and allow me to share your story, you will be able to view your images before they are shared to my website, Facebook, or other social media outlet. The only exception are those 'sneak peek' photos shared on my Facebook within the first 72 hours - but I always keep those PG. And you can always choose not to allow any of the more intimate images to be shared. My current turn around time is 4-6 weeks. At that time, your photos will be available for download in a password protected proofing gallery. For video, the turn around time is 6-8 weeks. Please allow 2-3 weeks after delivery of photos for albums and other print products to arrive. I strive to get every thing done in a shorter time frame, but because I put so much love and care into each image, it doesn't always happen. Do I receive color or black and white photos? I'm a lover of color. Most of your images will be delivered in color, though you'll get a number in black and white, too. I ask that you trust my taste as a professional photographer in choosing which photos belong in color and which in black and white. Sometimes, I'll deliver the same image in both. I just go with my gut and how each image speaks to me! I employ a backup photographer whom I love and trust for every birth I agree to photograph. In the event that I must miss your birth due to my error (illness, attending another birth, unforeseen emergency), and the backup photographer is not able to take my place, you will receive a full refund. If I miss your birth because it was too fast, you did not call me in time, the birth happened outside of my on-call window, or some other circumstance not due to my error, there is no refund. In that case you will be able to choose a fresh48 or newborn session instead. Again, please give notify me as soon as you think you are in labor and this will rarely be an issue. Awesome! I can't wait to chat! Go ahead and fill out my contact form (or click Book Now below) to set up a time for us to get together and chat. I am looking forward to meeting you.